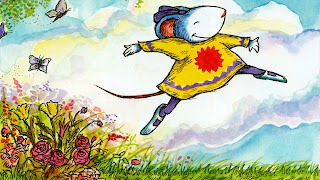 I am a sucker for Children's Books with amazing illustrations, and the first thing I noticed about Songs From The Baobab was the beautiful artwork! The illustrations of the African Lullabies and Nursery Rhymes the mothers were telling their children take on life through the colorful paintings. The textures and different mediums and patterns used creates a story in-itself to accompany the simple phrases. I appreciated that each page had the African words to accompany the English translations, and the story really comes to life when you enjoy it with the accompanying CD. Songs From The Baobab the CD includes 29 songs that are from 10 different countries including Rwanda, Senegal and the Ivory Coast. The beats range from uplifting and fast, to relaxing and soothing, and I felt like I could just imagine the people singing these songs with such joy and enthusiasm. The songs are sung in 11 different languages, and even though I could not understand them I still felt a connection to the women, children, and men singing. The kids really enjoyed listening to something in a foreign language and would often stop to interrupt and tell me the translation-which was very hilarious! We also enjoyed how each song concluded with a brief description of the cultural significance of the song and instruments used. 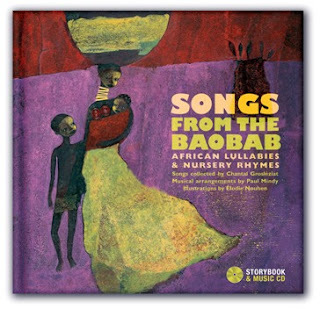 Songs From The Baobab CD and Book are a great way to add some cultural history from Africa into your little ones library. Check out Songs From The Baobab from The Secret Mountain.com for images, commentary, and audio samples. You can even purchase the album to add to your MP3 device! There is something about the teacher in me that runs our free time at home like a classroom. If we are going to watch a show on TV, is it educational? Is the book we are reading at night serve a purpose other than entertainment? Can you count those vegetables before you eat them?! Seriously, my brain never turns off. 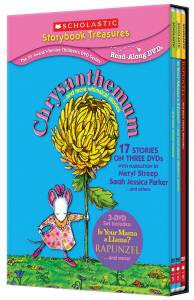 So when I hear the name Scholastic I do think "educational," and they did not disappointed with their latest release boxed DVD set Chrysanthemum...And More Whimsical Stories. The set comes with 3 DVDs, each of which is at least one hour long. Every disc contains short stories that are read aloud by celebrity narrators. I had a fun time guessing which ones Sarah Jessica Parker, Meryl Streep, and Danny Glover read! I really liked the "old-school" aspect of these stories in that the original artwork (in most cases) was used, rather than a beefed-up cartoon that really takes away from the story itself. It reminded me of working in the classroom and reading a Big Book to my students. Now you can watch these DVDs at home and have the same feeling. Ahhh! The BEST feature of these DVDs is that the "main stories" on each disc showed the words at the bottom and highlighted them as the narrator read along! Hooray, Scholastic for encouraging one-to-one correspondence for little kids, and the read-along capability for older kids. I was a little disappointed that the "bonus stories" on each disc did not have this feature, but they were still enjoyable; however, the teacher in me was sad. Is Your Mama A Llama?-NOT to be confused with the Mama Llama series that is so popular today! For under $25 Scholastic Storybook Treasures: Chrysanthemum...and More Whimsical Stories is a must-have! 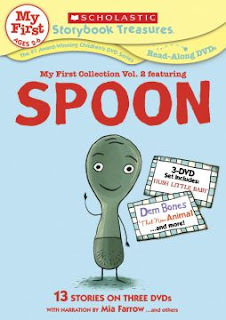 You will have over 180 minutes of short stories to watch that will help your child learn various reading skills from building one-to-one correspondence, recognizing sight words, and reading along. Buy it today and "Like" New Kideo on Facebook to see all the latest and greatest from Scholastic as they are released! 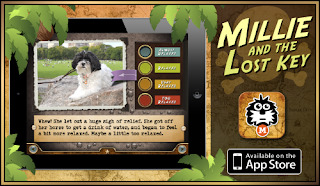 Millie And The Lost Key App Review: Dog Gone Cute! There are so many children's APPs out there now, that finding one with the right fit (for the right price) can be a little tricky. Well, Millie And The Lost Key by Millie Was Here is an amazing one for your little boy or girl, and for $3.99 I think it is worth the price. Plus you can get the free APP "Meet Millie" to kick off the series and give it a try. I have tested out a lot of APPs for kids, and it seems like the interactive features in some are great, but in others fall short. The features often over-shadow the story, but in Millie And The Lost Key you get the best of both worlds: creative interactive features AND storyline. Millie And The Lost Key is about a dog named Millie (who looks scary-identical to my Tibetan Terrier Sami I had as a child!). Millie goes on an adventure trying to find the key to unlock the treasure box filled with her favorite treat. She ventures through many obstacles (all set in and around New York City with real photos) to find her long lost love-bacon. What makes this APP really unique is that the storyline is set around original photography! You actually get to meet Millie and see her in action as she searches for her treasure. The photos are paired up with interactive illustrations at times, and you even have the option to make Millie do different things (like fly a plane, calm down, search around, and more). The APP has three modes to play in: read to me, read by myself, or my new favorite-bedtime mode (in which the sound is lowered and all the game features are disabled). 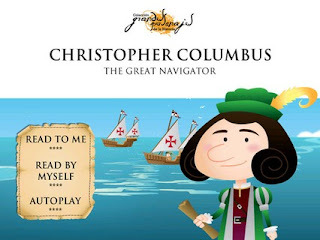 The narrator's voice is great and really makes the story come alive. As a Reading Specialist, I especially like that the words are lit up as the story is read aloud! Hooray, teaching kids one-to-one correspondence in a fun way! -scratch off pictures similar to lotto scratchers-new feature I have never seen before and the kid's favorite! I could probably fill up this entire post if I named all the features, so you will just have to try it for yourself. Millie And The Lost Key is appropriate for any age child, and there is nothing inappropriate (within the wording or context). This book is a sweet story in a collection of APPs about Millie! I am excited to see what comes next! Recently, I was asked by a My Reading Specialist.com reader about which techniques are most effective for silent reading, and how one might acquire this skill. This is a great question that I felt really needed a post to answer all the parts. Here is the reader's comment, along with my embedded answers in red. I have a question about how one should read when they are reading silently. I was recently talking to a friend who is a very good reader. He told me that when he reads, his eyes see the words and the words "click" (or rather the meaning of the words "click") in his brain and he understands them. He told me that when he sees numbers, they slow him down because he has to actually say them in his head. There are two methods of reading silently: subvocalization (saying the words inside your head), and non-subvocalization in which you are not saying the words but rather thinking about the meanings of the words. It is interesting that numbers slow him down; however, if they are in the numerical form rather than the written word I can see that connection. That is likely due to the area of the brain that does mathematical functions as opposed to the portion of the brain he uses to "define" the words inside his head. I realized that when I am reading, I actually say every single word in my head, as if someone was reading it aloud to me. I often do this as well. I found that I had to practice reading in a faster manner (regardless of clarity) a few times to make my brain more comfortable with the feel. This 'forced speed reading' does help you train your mind to gloss over words and interpret meaning rather than saying these words subvocally. It is something you really have to work at, but can be done. So I have a few questions about this. 1: Which method is more efficient; actually saying every word in one's head, or being able to look at the word and instantly understand its meaning? -No Subvocalization is great for reading at a very rapid pace, and is good for total comprehension of the entire written work. 2: As I suspect the latter, how does one acquire this? You must work at it. The reason you are using subvocalization is because you were taught that way! As a child you began by reciting letter sounds of words aloud and then you would transfer this skill inside your head. I suggest taking time each day to read by speed reading the passage as fast as possible first regardless of accuracy. Then go back and try it a little bit slower. It is important to try and think about the 'meanings' of the words and NOT the words themselves. Of course, this is very difficult. With practice you will begin to improve and your speed and accuracy will pick up. Just like how you learned to read as a child...this is a process! It has to be worked on over and over to achieve mastery, but it is a very great skill to have. If you find that you are stopping more than 5 times in a 100 word passage (this is known as the 5-finger rule) the context of the passage is above your reading level (ie: your vocabulary is not high enough to achieve mastery). Having a high vocabulary is absolutely a key to learning to read quickly. My suggestion to increase accuracy: crossword puzzles, scrabble, online word games with definitions. One more, slightly off-topic question. Is it possible to learn to read multiple words at once? Is it possible to learn to see and understand say 2, 3 or even four words at once, so when you are reading you are able to read by moving your eyes less and less sideways and thus you can read much faster? If yes, how might one acquire this? Many speed-reading programs would say yes. I have heard that it is possible to train your brain to read multiple words at once and comprehend them; however, I admit I have not experienced this myself. I find that as I read quickly that I will "flash" my eyes across a line and pick up many (but not all) of the words at once. When I think about it now (since I obviously don't as I am reading), my brain can very often fill in the blanks when it comes to conjunctions (and, for, or, so, etc), and other high frequency words. Therefore, it appears that I am reading multiple words at once, but in actuality I am reading portions of phrases. *I really hope that I was able to answer all of your questions, and that you have a good place of where to start to acquire this skill. Have you tried these techniques? Did they work for you? It's that time again you lucky ducks! Today's review of the TouchyBooks story The Witch's Apprentice also has a giveaway in which 5 winners will get to pick the Touchybook story of their choice loaded directly on to their iPad or iPhone. Only takes a few seconds to enter! Practicing magic spells on the cat and turning her into....whatchamacallits! This TouchyBook is definitely on our must-have list. Now is your chance to win it (or another book of your choice). 5 people will win a TouchyBook of their choice. Just complete at least the BOLD entry below, then complete optional entries for more chances to win! If you have any problems entering using this Rafflecopter giveaway, please leave me a comment below. Good luck!